New appointments and airport spending occupied county commission this week. The Dukes County Commission appointed three airport commissioners, approved action on more than $1 million in airport borrowing and appointed a county treasurer to serve until the 2020 state election at its Wednesday meeting. 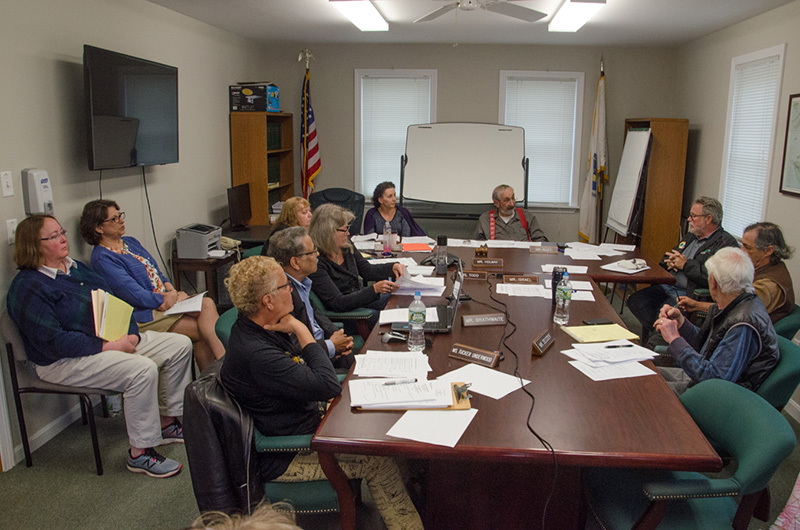 In a close vote, the commission reappointed Clarence (Trip) Barnes, and Robert Rosenbaum to three-year terms on the Martha’s Vineyard Airport Commission. Also appointed was former West Tisbury selectman Richard Knabel. In the first round of balloting for the seven candidates who applied for the three positions on the airport commission, Mr. Barnes received five votes. Mr. Rosenbaum, Mr. Knabel, retired airport consultant Geoffrey Wheeler, and Island businessman John Clarke all received four votes. In second round of balloting which included only the four tied candidates, Mr. Rosenbaum, with four votes, and Mr. Knabel, with five votes, emerged as the choice of the commissioners. Mr. Rosenbaum, who currently serves as chairman of the airport commission, and airport manager Ann Richart appeared before the county commission to request action on several borrowing matters. The airport officials asked to roll over a current $450,000 loan until they receive grant reimbursement from the Federal Aviation Administration. They also asked to borrow an additional $420,000 in anticipation of a federal grant. Airport officials also asked the county to file legislation which would authorize the airport to borrow another $690,746 to cover its share of capital improvements, including the new airport rescue and firefighting building, bathroom upgrades, snow removal equipment and repairs to the airport’s wastewater treatment facility. “It’s basically to take care of a cash flow issue based on our capital expenditures,” Mr. Rosenbaum said. But the request drew sharp criticism from county commission chairman John Alley and commissioner Leon Brathwaite. Commissioner Bob Zeltzer offered support for the request, saying he was surprised the loan requests were not higher. After a long debate, the commissioners approved all three actions. Mr. Alley abstained or voted no on all three items, while Mr. Brathwaite abstained on two of the three requests. Commissioners also clashed over the appointment of a new county treasurer to replace Noreen Mavro-Flanders, who retires on June 2. In her resignation letter submitted two weeks ago, Ms. Mavro-Flanders recommended the county commission appoint assistant treasurer Ann Metcalf to serve until the state election in 2020. Had Ms. Mavro-Flanders stepped down a little earlier, a new treasurer could have been elected in this fall’s state election, but the nomination period to file for candidacy in that election has passed. Several commissioners advocated opening up the hiring process to see if other candidates might be appointed treasurer. But commissioner Gretchen Tucker-Underwood said Ms. Metcalf has been working closely with the treasurer for the past year in anticipation of the retirement of Ms. Mavro-Flanders. “To open it up at this point is contradictory to what we’ve been working toward the last year,” she said. Others proposed appointing Ms. Metcalf as acting treasurer for 60 days while conducting a search for other candidates. A motion to appoint Ms. Metcalf as acting treasurer for 60 days failed 4 to 3. A subsequent motion to appoint her as treasurer until the 2020 state election passed 5 to 0, with commissioners Brathwaite and Alley abstaining. The county treasurer’s salary for the current fiscal year is $107,980. The assistant treasurer’s salary is $56,534. Are they even allowed to offer a 108k job for 2.5 years to someone without a competitive process? Even if they are, given the general distrust of the county government, should they have done this? No swipe at Ms. Metcalf, I am sure she is qualified, but even she should expect she'd have to earn that position. This is pubic money. How very old school. Just hugely irresponsible.